Reading about work is a form of procrastination. But you learn a thing or two. Or get embarrassed by your own laziness and go finish a couple of to-dos. I've been writing about artists' rituals intrigued by a story about a philosopher Friedrich Schiller. Some reliable sources say he kept rotting apples in his desk drawer. A strange move, I agree, but apparently the smell helped him concentrate and write better. I find it fascinating: If a man went to such extremes to maintain focus in a screen-free world of 19th century, how can we possibly focus today? I hope Ged Sia (Gediminas Šiaulys) has the answer. I park at his creative lair and take a look around before pinging him. It's the best location ever. A pine forest on one side and a river-beach on the other. Sandwiched in between, a modernist building patterned with wooden planks. Although it looks like an eco resort, it's actually a center for Arts and Education. Ged is a resident here. Technically I'm still in the city, but I can barely hear any traffic, only a church bell in the distance. Good thing I don't work here, I think to myself. Nothing would get done. I would kick pine cones around and watch the ducks. Plenty of ducks here. I fight my impulse to procrastinate by bird-watching and go inside. It's quite difficult to pin down what Ged does exactly. A multidisciplinary artist would be a good term, but it's been overused by kids who once tried Photoshop AND illustrator, so I tend to avoid it. He is an illustrator, a designer, a craftsman, a film director, an art director and a screenwriter. Not to forget a husband, a father and an occasional basketball player. It would make a crowded business card if he had one. 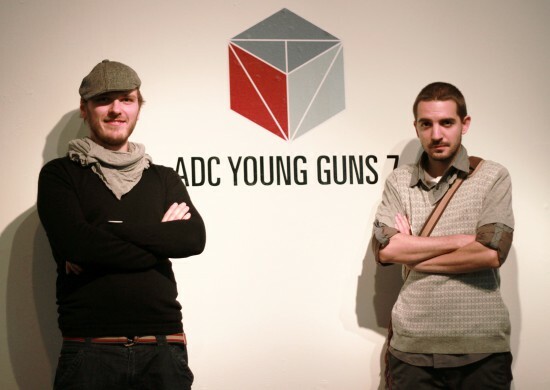 Ged has been designing for many years, but his talents truly blossomed in 2005 when he and a comrade design prodigy Andrius Kirvela co-founded a studio and baptized it PetPunk. "Back in 2005 motion graphics were exploding in popularity — our jaws dropped when we saw stuff from studios like Psyop, Pleix and MK12. They were combining illustration, video footage, 3d, music, visual and sound effects into one devastating punch," Ged says. "We felt that motion graphics could have the biggest impact on the viewer. And you should try make the most impact with your work." The reign of PetPunk was indeed impactful. The guys burst with productivity fueled by youth, enthusiasm and energy that occurs only when you have "punk" in your name. Work coming from PetPunk was a rare breed of hand-made and digital, ethnic and futuristic, conventional and cutting edge. Seeing this, everybody cheered, me included: "Finally we have a creative brand we can show to the world without an apologetic cough!" we thought. And the world seemed to agree. Work coming from PetPunk was a rare breed of hand-made and digital, ethnic and futuristic, conventional and cutting edge. PetPunk soon landed Sprite, MTV, Vodafone, Nike, Computer Arts. They also got decorated with an ADC Young Guns award, which, some would argue, is an even bigger deal than the world famous clients. Festivals and conferences such as Pictoplasma, Playgrounds, European Design Conference, Visuelt and myriad others invited PetPunk to come over and share their magic creativity recipes. Besides working with big brands and winning awards they miraculously made time for personal projects too. Mostly inspired by and dedicated to their own kids. A children's theater play "Dad's Tale" won them a Golden Stage Cross award. I've seen the play and even as an adult it left me dumbfounded. Like in a well produced animated film, each minute of the play was picture perfect. There were lights, lasers, otherworldly characters and even some mild psychedelia. It was like Tron meets Adventure Time on stage. The Cross is well deserved. But lately news coming from PetPunk have become more rare. Or maybe it just seems that way. There's so much new stuff everyday, easy to lose track. "So, how you've been?" I ask Ged over the buzz of the espresso machine. "Now I'm doing fine," he says, "but it's been a tough couple of years. Three actually. We've been trying to finish this short film, Running Lights." Tough is not how imagine PetPunk working. "Why so?" I ask. "Well, the production turned out to be much more difficult than we thought. When we showed the idea to friend producers, they said it's going to take five years. We, of course, just laughed it off and (almost) said yeah 5 years for somebody less talented maybe," Ged chuckles. "But there you have it, three years later I'm still working on this thing." "The script is elaborate and we had lots of crazy visual ideas. First we wanted to make it fully in stop motion, physically creating each character and each set and then moving everything frame-by frame. It soon proved to be impossible. We didn't have enough man-power for a project of this scale," he says. Pressed by the deadline they decided to switch to full 3d to save time, but faced other technical challenges. The film stalled. Now Ged has finally found the right team to help him, but there was a critical time when he almost quit too. On set of Running Lights. Photos by Darius Petrulaitis. "It's been a struggle, but I couldn't abandon Running lights. It's a film about death for kids, so It would be unfair to them and to myself if I just ditched the project. I feel I have to finish it." Ged mentions the importance of finishing several times during our conversation. It's weighing on him. "You can't grow unless you finish what you've started," he says. "When work is done, the result can be good or bad, but at least you see and know that. Finished work is something you can discuss, get feedback on and plan next steps accordingly. If you don't finish, you get ridden with doubt, it becomes a part of your mental baggage and slows you down." Now Ged is trying to de-clutter his life of anything that deters him from finishing the film. He even stopped playing basketball. "If Nike came and asked to do an ad, I'd have to politely decline and say sorry guys, I'm working on Running Lights now" he smiles. PetPunk had similar difficulties before. "There comes a breaking point, where enthusiasm fades and issues build up," Ged says. "You either pass that point or you don't. We abandoned a couple of projects in the recent years. I felt we needed to either break the curse or become serial non-finishers." "If you don't finish a project, you get ridden with doubt, it becomes a part of your mental baggage and slows you down." In Running Lights a rabbit gets hit by a car and dies. His soul splits into a bunch of smaller spirit entities, which run around and then merge with everything in the forest. Trees, eggs, pinecones, even stones. Ged' studio is full of artifacts from the movie – sets, puppets, sketches. There's a meadow on a table, lush with thousands hand-made blades of grass. This is where rabbit roamed free before meeting his grim end. Now the Plasticine version of him is resting on one of the shelves, frozen in a mid-leap. I notice two other important puppets, a boy and a girl in colorful hoodies stood on the table. In the film they are the ones to bury the fallen rabbit. "Why did you decide to make a film about death for kids?" I ask. "My daughter started asking questions, so I wanted to make an illustration, to help her build a framework of how to view life and death. Reincarnation is quite easy for kids to grasp. It's just the idea of the cycle of life, things dying and bringing life to other things. She has already decided to be reborn as a panther," he laughs. "At PetPunk we had our share of success with awards and festivals and so on. But now I'm at a stage in life where I need to express my values. I want to create films that would pass the test of time instead of maybe winning an award or just being pretty for a week," he says. "Reincarnation is quite easy for kids to grasp. It's just the idea of the cycle of life, things dying and bringing life to other things." And yet, Running Lights is pretty. Ged shows me some still shots from the film. I especially like the spirits, semi-transparent creatures with glowing tendons. "These ghosties look like they've been inspired by some shamanic rituals" I say half-jokingly. Ged smiles and says he hasn't done any psychedelics and barely even drinks. This hallucinogenic aesthetic comes to him naturally. "What about reincarnation?" I say. "Is it also a concept that's natural to you?" He looks at the ceiling, thinking. "I'll be honest, when it comes to the afterlife, I've more doubts than beliefs. I can't get rid of the notion that we're just puppets of animated meat and when we die, we die," he says. "The movie is just one of possible ways to look at death. The world is tough as it is, let kids have hope." "However, all my skepticism aside, some truly strange things happened when I struggled the most with this film," he says. "I almost started to believe that there is some greater force, some flow of information I suppose. The winter of 2015 was especially difficult, because I was trying to push Running Lights forward alone. One day my wife met a couple of designer friends and mentioned she was worried about her struggling husband. They immediately volunteered to come help me." Pijus and Lynn worked with Ged for a month and it marked a shift in mood and morale. Together they managed to make a primary version for the first screening, but it was still far from the film Ged envisioned. He needed a good 3d specialist. Fast forward to spring. Riddled with heavy thoughts again Ged went outside to clear his head and walk by the river, which he usually never does. There was this fellow, a 3d artist Jonas which Ged knew, sitting on the bench having a snack. "I asked to join him" Ged says. "We chatted and he said he'd left his job at a CG studio. So, what you're going to do now? I asked. I'll come work for you, he said. It was hard to believe it. He was exactly the person I needed to help me!" Jonas and his 3d skills were in big part responsible for the turnaround of the project. He still does the most of the heavy lifting with the production. "But wait, there's more," Ged continues. "Out of the blue my producer Miglė Pelakauskė got a call from a famous singer Jurga Šeduikytė. She wanted to come and help with the film. Just when we were starting to panic about the soundtrack, or rather about there being no soundtrack. Another animator, Hleb contacted us asking to do an internship. Just when I was nagging Miglė that we desperately needed composer to merge 3d and set photography together. And it doesn't even end there" — It looks like even he has trouble believing it. "By then we had finally blocked scenes in 3d, but we needed to put them in motion. I nudged my producer to look for animators. Guess what, the very next day we got an email from a French animation student Sarah, asking to do an internship at PetPunk," Ged says. "By that time miracles had become almost the norm, so I wanted to see how far can I take it. Jokingly I said: you know what's better than an animator? - two animators! Next day Sarah wrote asking if her colleague, Jeremie could also come. It was unbelievable, they even brought their own beefy computers to do all the rendering," Ged says. "As if some supernatural being was helping me. Need a 3d expert? An intern? A vocalist? Animators? Check, check, check, check. I almost heard the universe saying: here, Ged take these gifts, you have no excuses now. After this mysterious help we found a good pace again, I regained belief in myself and the project, everything started moving uphill," he says. "Wow, the law of attraction is really working for you," I say. "Yes," he laughs, "it's important to know what you need and when the time is right, the universe delivers." But Ged doesn't suggest anyone should just sit there and wait for universe to intervene. "Remembering myself ten years ago," he says "with what I know now, I’d do some things different. I would invest in myself more, learn as much as I can. I’d also try to figure out what's truly interesting to me, and go for it full speed. Now when I look back, I know which project helped me grow and which was a step to the side. Then I didn't know that, didn't have such a clear direction." "So, what was it like when you guys just started as PetPunk?" "We surely had a lot of confidence and optimism, but it was rough from the practical standpoint. We barely made any money between me and Andrius. Only Elena, my wife, had a grown-up job in an ad agency, so we mostly lived from project to project. We had no pragmatic thinking then, but I really don't regret it. Now I see young guys straight out of university getting in the design business, founding studios. I see the cars they're driving, the clothes they're wearing. How can they afford all that? Loans, I reckon. They set themselves up for a rat race. Now they will have to work, to be commercially successful to support the lifestyle they've thrown themselves into." PetPunk's multi-camera live stream website. Years before Stefan Sagmeister did the same. "And I think this robs young people from experiments, from stupid, unprofitable, but bold and fun projects," he says. "My question to those people is when — when will you get everything out..?" He says holding his hands in front of his chest, making gestures of expansion. "...All the potential, all the great things that are in your head. You're young, energetic, unrealistic, have no children and no debt. It's the golden age, you can conquer the world! But again, It's just how I see it. You can be practical, do simple design stuff, but afford to take the family on a holiday. Which is fine too. As simple as it sounds, do what makes you happy." "You're young, energetic, unrealistic, have no children and no debt. It's the golden age, you can conquer the world!" It seems that Ged found what fulfills him and has his creative direction all figured out. His visual style, as far back as I remember, also remained distinctively his own. "Whenever you draw something, it seems to come out soft and bubbly. What influenced your visual style?" I ask. "I guess I've always drawn like that. Rounded, no sharp edges. I think those are some imprints from the illustrated books I read as a child. When I drew, it tended to look round. I remember even my dreams being claustrophobic, filled with some strange big spheres" he says. "There's a picture of a fat tree on the wall above my desk. I think it's the essence of my style. Whenever I start forgetting who I am, I look at this tree and I'm back again," he says. We go up to the second floor of the studio where his desk is located. He points to the picture of the fat tree just above his display, it looks pleasantly swollen like a piece of bread dough that's been sitting in a warm place. Ged' desk is densely populated with figurines and talismans, all kinds of pictures on the wall. There's even a shelf dedicated to characters and props from past projects. On his screen there's a black square Photoshop canvas with three spirits from Running Lights. I suspect an Instagram post in the making. "How do you choose what to post?" I ask nodding towards the screen. "I try to post what reflects my style the strongest. You can say that I use Instagram to manage expectations. I want people to get an instant idea of what I'm about and what I can do for them." "Do you browse other designers' work?" "I do, but recently I've been more cocooned, can't remember being really inspired and driven by somebody else's work. Maybe it's just my need to focus on finishing Running Lights. I noticed that I don't really seek external influence anymore, Instead I turn inwards and look for inspiration there. The blossoming chair that I crafted recently is a good example - I was focused entirely on myself and on the process." Ged is talking about the blossoming cinema theater chair he created for Vilnius film festival. He brought it to life with leaves, spores, buds and, of course, blossoms. It's so detailed, I was surprised to learn he did everything by hand. "I think I always leaned towards the real, tangible stuff," he says. "About a year ago I thought that crafts were the only thing that I'm interested in. When I work with my hands I get physically excited - my heart starts pounding, I get a flood of emotions, I feel more human. I can express my frustration if something doesn't work out, punch a block of wood for example or bite a puppet's nose off. After a day of cutting, carving and plastering I feel much better physically. More grounded and at ease. Stop-motion animation is especially satisfying, because I see the character in his little world I've created. And I'm moving it, bit by bit. It feels like I'm bringing it to life," he says. "I can express my frustration if something doesn't work out, punch a block of wood for example or bite a puppet's nose off"
"I enjoyed the process of the chair so much I was ready to renounce all digital arts. However, then Jonas joined to help with Running Lights and I saw what a true talent can achieve in 3d, all the intricate details, the amazing animations. I had to change my mind again. I'm always somewhere in the middle between the real and the digital. My work will always be a mix." "Obviously now you're single-minded on finishing Running Lights," I say, "but have you thought about your next project?" "I want to keep making movies. I want to do a full-length animated film," he says and pauses. We chuckle as we just talked about how tough it is to make even a short film. But I'm glad he's already thinking about an even bigger challenge. "I want to base it on some true humanistic values," Ged says. "I want to encourage people who are less fit socially, who are struggling to fit in. When you come to think about it, a lot of films in the theaters have perfectly good and positive ideas. They often say that life is a gift, that you can work and accomplish a lot or just simply be happy from day to day. However, those good stories are often told in a way which is a bit too shiny, too polished and is difficult for some people to relate to. Especially for those who need this inspiration the most. They think it's a nice story, but it's not about me. If I could make a film that would bring some light and strength to folks who need it, I would consider it a huge success." On set of "Šviesa" - Ged's next film about book smugglers. My questions have already stolen half a day from Ged. Time, which I know, he wanted to spend on finishing his film. We go outside, scare some ducks away, shoot some quick video for my film and part ways. Driving back I think about productivity tricks. Did I learn any? Unless we consider getting help from the universe a productivity trick, I guess not. Ged doesn't rely on tricks. I did, however get reminded how important it is to finish what you started. When work gets difficult, vigor and determination separate professionals from mere doodlers. But everybody knows that! We know that the recipe for getting things done is work. So what about those magic rotten apples to do the work for us? I'm pretty sure they're out there. I'll keep looking.